For years, we’ve known this. We’ve seen the horror, the chaos, the devastation left by these terrible wars. Will there never be peace? Will the monkeys ever make peace with the Ninja and stop throwing bombs at them when they try and pull them off their platforms? … Wait what?! 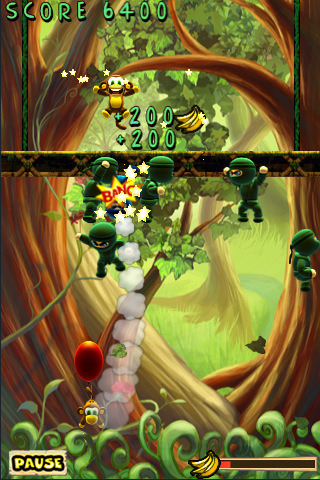 Munkey Vs Ninjas, released by Rana Bros, is available on the iPhone, iPod touch, and iPad for $0.99. I don’t even know. You play a cute Monkey on a platform. Ninjas appear and toss up dynamite attached to balloons. If your platform gets hit, it lowers to the ground. You’re goal is to save little monkeys on balloons and kill ninjas to raise up the platform. 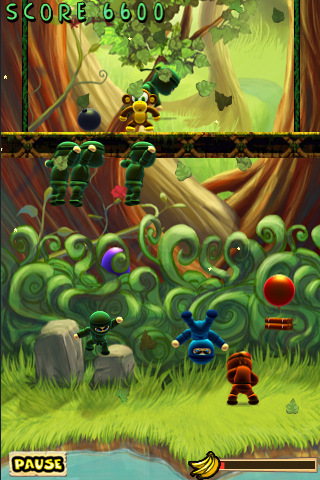 Enemies come in huge swarms and you have to be very careful where you toss your bombs and what you hit since hitting little monkeys will lower your platform. If your platform hits the bottom, then I guess the Ninjas are having Monkey for dinner tonight or something. Firstly, the game doesn’t allow you to directly control the monkey. You must tilt the iDevice to move the monkey and I can’t tell you how unreliable this is in a pinch. Giving us the option to drag our fingers to move the monkey would have been great but as it is, it’s a gimmicky and unreliable way to guide the monkey… and considering how crazy frantic the game gets, this is annoying and frustrating. Your bomb dropping depends solely on where your monkey is standing. Add the lack of direct control and this becomes painful. Ninjas move so fast and there is just so much on screen at any given time and they all move extremely quickly. It just feels unfair by later levels. Finally, the last thing I just couldn’t get past in order to like this app was the background. Yes it’s extremely pretty at first, but once you are in game, with all the green ninjas, the giant bombs, smoke effects, balloons, and other stuff moving around on screen, the detailing just obscures everything that’s happening. I can’t see half the stuff happening and it’s too busy to make sense of the screen. Add that I am red-green color blind and this game is incomprehensible in the frantic pace. I couldn’t enjoy this one, but it’s a game that works. No crashing, no bugs, and the game clearly works for the first couple of minutes whenever I played. I just didn’t want to play after a day or so. Munkey Vs Ninjas is OpenFeint compatible, which means high score submissions of course. I would say, everyone else should try this app out. It is rather entertaining and maybe you’ll find more enjoyment out of it. The frantic pace might just be perfect for others, but for me personally, I just didn’t like the pace or gameplay controls. So if you’d like to save those cute little monkeys from evil little Ninjas, pick this up and start tossing those bombs! OF COURSE!! AppSafari review of Munkey Vs Ninjas was written by Joseph Ho on January 5th, 2011 and categorized under App Store, Games, Scrolling Shooter. Page viewed 3282 times, 2 so far today. Need help on using these apps? Please read the Help Page.